Maturity test passed with flying colors! 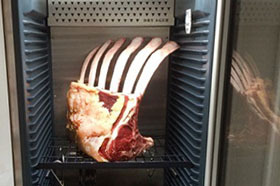 With the “ Dry Ager” you can condition meat without foreknowledge! 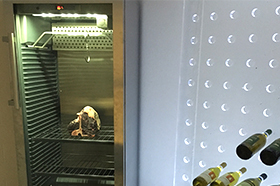 Almost four weeks long in the “Dry Ager”, the first conditioning fridge for your home. Terrific fun and terrific taste! The best present for men in the world! The scent of fragrant juicy steaks on the grill is for many people, especially in the summer, probably one of the finest in the world. 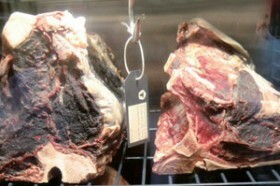 Dry Aged Beef tastes intense and original. 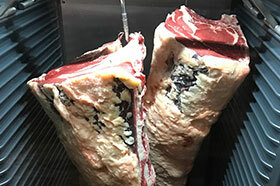 The Dry aging beef is a laborious process. 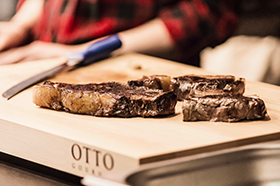 It takes a lot of effort, a lot of time and a lot of knowledge to make a really good steak. The Dry Ager makes this traditional production process possible for each end user. 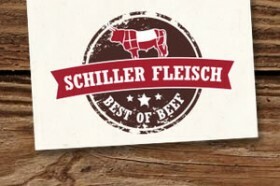 Best with German Simmental cattle back from our online butchers. Read here the whole story about the DRY AGER® and the people behind it. 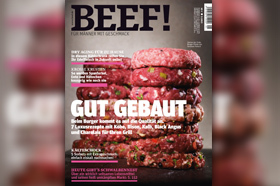 BEEF! writes: There can only be one meat: beef, dry-aged. And there can be only one refrigerator: our “Dry Ager”. For home, forever, for you! 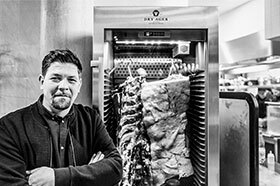 I only use products in my kitchen from which I am fully convinced and that is 100 % the fact with the Dry Ager: High-quality workmanship, a classy design, top dry-aging results and enthusiastic customer feedback in my brandnew restaurant “Die gute Botschaft” in Hamburg. 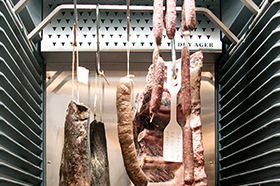 The Dry Ager is the only possibility to make our meat even better. 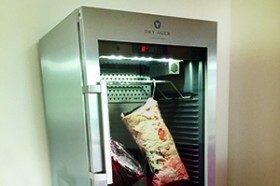 We mature our Wagyu from Schergengrub in these top devices and we have noticed: there is no alternative! We are happy to have found a partner in Landig, who shares our quality expectations and implements it exactly as we have always desired. 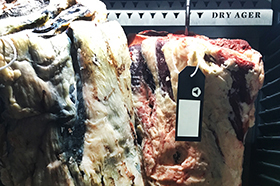 The Dry Ager meets the requirements of the method of dry aging, to process meat in its highest level to the point. 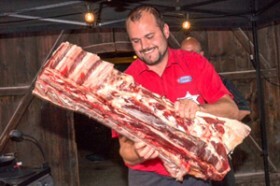 Me as meat expert convinced the result and functioning of the Dry Ager team absolutely. Wir nutzen den Dry Ager nun seit zwei Monaten bei uns auf dem Carlsplatz in Düsseldorf und sind begeistert! 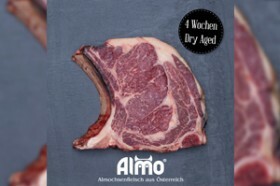 Nicht nur, dass wir einen Teil unserer Produkte noch veredeln können, auch unsere Kunden lieben es zu sehen, wie sich das Fleisch im Dry Ager entwickelt. Basically, we have a three-ager: With three cabinets one has many playing possibilities. For example, the prefabricated pieces in the right cabinet. 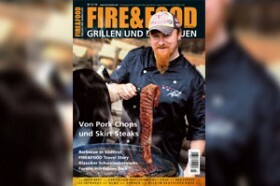 This allows the customer to choose directly what we should put on the charcoal grill. 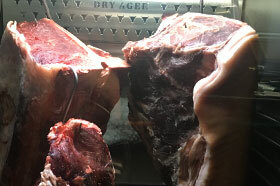 At the moment we get the cattle ridges 14 days dry, because the raw meat in the restaurant does not look so good. The part in the left cabinet has now matured for six weeks. 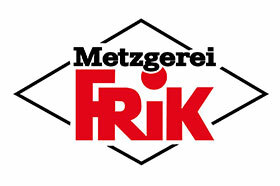 From companies in Austria I know that this can be really borderline. 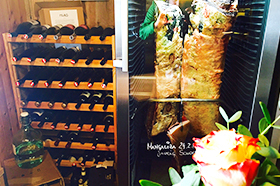 But we tried the meat yesterday – sensational! I understand why this is the world’s most prestigious manufacturer of maturation cabinets. 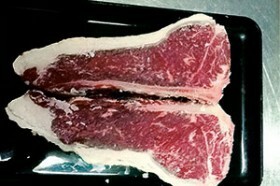 My Spanish meat wholesaler has recommended it to me – meanwhile the parts are everywhere in Spain. The DryAger does not only have a very good functioning, it also looks very elegant. The DryAge cabinets have upgraded our entire department. 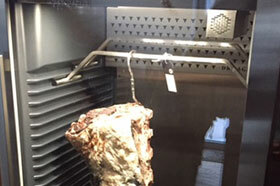 The Dry Ager is not only very decorative in the kitchen or living room, it also gives you full control over your meat. So you are no longer tied to conventional ripening times and you decide for yourself when your steak has reached the zenith of the taste. Experiment with Cuts and maturing times – an experience that no professional, ambitious hobby cook or meat fan should be missing! 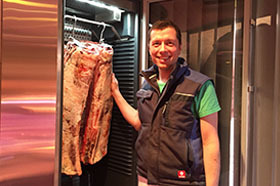 OTTO GOURMET says “go mature meat with the Dry Ager!”. I have already used my Dry Ager twice with excellent results. My first distribution of a bark printing was unfortunately not completely succeeded however the second time I had developed a better strategy, with better results. 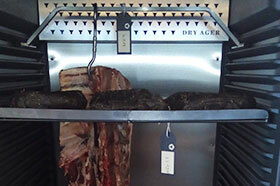 The dry ager per se is impeccable and the meat after 10 weeks of deposit was absolutely clean. The cleaning between the bearings also went quickly and without difficulty. 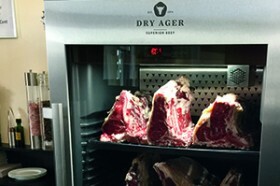 For those who appreciate the good meat, a dry ager is absolutely awesome. Perfect results for any meat. For the customer, it is a symbol for the manual handling of food. Is very quiet and easy to maintain. Technically mature: even for extremely long ripening times, it offers the perfect climate (absolutely no spoilage)! 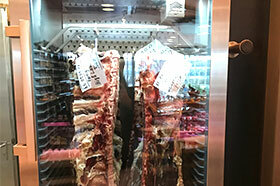 An absolute enrichment for our butcher shop. 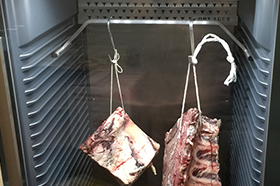 Dry aging, or traditional “hanged well”, has been celebrated by my father and grandfather. 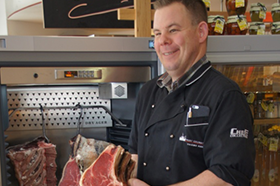 The Dry Ager has made our Landsberger meat delicacies even better. The result is so convincing that we have already ordered the third Dry Ager within three months! The butcher Zorn has decided for a dry ager, because the tasty meat can be presented excellently and be lifted from the usual meat. 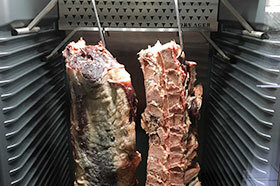 Two other reasons for the Dry Ager are color retention and section minimization. 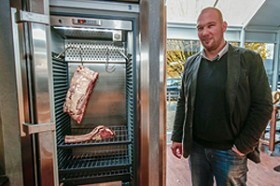 “Since our guests see the meat in the cabinet, it sells by itself. Our guests are so excited! Sometimes it does not mature as fast as we could sell it. 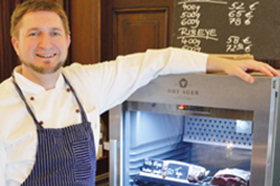 “Good things take time and we sometimes comforting to a meal a week later.” says Andreas Müller, chef and catering manager, Hotel Zumnorde am Anger, Erfurt. I’m still more than happy with the Dry Ager, through the perfect finish and great looks it stings just immediately apparent. The maturity cabinet is so good in my shop that it has probably already paid off almost 3 times. 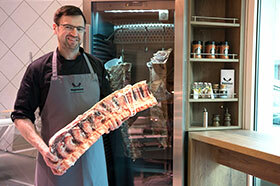 The Dry Ager is simply the best way to present my handcrafted products and my quality meat adequately. 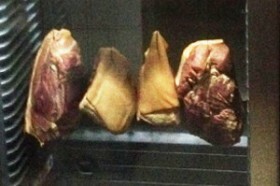 From the mountain Salamis on the hams to the dry-aged pork and cattle is just perfect. A great compliment to the company Landig. From purchasing via the communication and support to delivery, it just all works perfectly! the maturity cabinet works great. Unfortunately, the device is better than the meat quality available to buy. 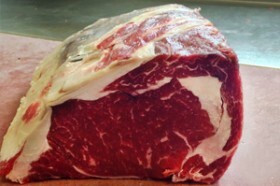 A great eye catcher at the meat counter and a successful addition to our offer! About 10% more steak sales speak for themselves. 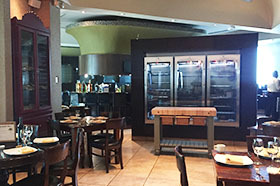 The dry ager is used in my restaurant. In addition to the beautiful appearance, it inspires by sophisticated technology. A top product that is a pleasure. The best investment for years. 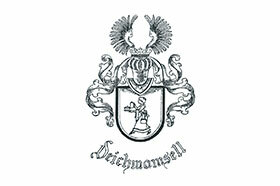 Ostermühlen Gourmet exclusively sells the products of our own farms. 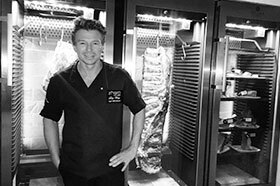 We have made it our mission to make our food available to our customers with the utmost craftsmanship, complete transparency, uncompromising sustainability and the highest quality. Maturation and refinement is a critical step – and the Dry Ager has never disappointed us! Super cabinet which fully corresponds to our ideas. 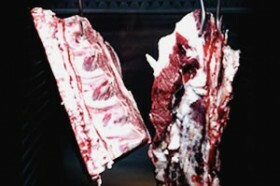 The meat becomes delicate and gets its special touch. We even let the pig’s moth mature in the fridge. 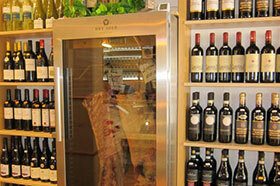 The Dry Ager is in our shop and is very well received by our customers. One of the best investments of recent times. 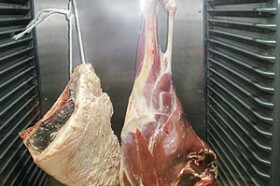 The difference to meat which has not matured in dry ager is very clear. Of course you get 100 points. We are more than satisfied with the maturity and the results. With the best knowledge we can recommend their devices! 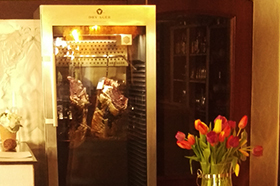 I do not only use the DRY AGER to mature meat, it is also ideal for the storage of my whiskey and my wines! Customers are thrilled, we are thrilled! What we can sell has hardly anyone on offer – Great! 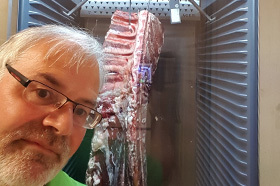 I bought the Dry Ager dx 1000 and I’am impressed with the maturity quality, not only the great taste refinement but also the low weight loss of 8-15% is the hammer. In comparison, it is always assumed to be 30-50%. The Dry Ager is an integral part of us, we have made great experiences and our guests are very enthusiastic. We have already different products in the Ager ripened and are very satisfied. We can only recommend it. 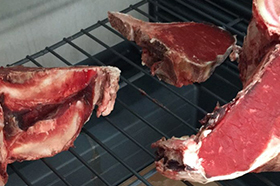 We are very satisfied with the bone-ripened beef. The next goal is to make your own salami in the same refrigerator compartment. We have been using the Dry Ager for about 1 year. 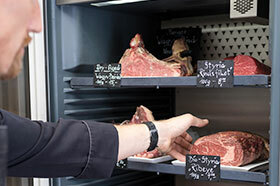 Sales have risen by a multiple as far as the Dry Aged products are concerned. Price performance fits, no disturbances, easy to maintain. We have been using the Dry Ager for 5 months in private use. 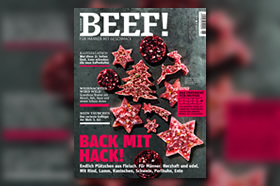 The following projects were carried out with great success: Production of deer salami in the natural ripening process – Production of air dried deer – 33 days of ripening of 4 backstrands of Simmentalern heifers. An aromatic salt climate is used to produce salted salt from the Alps. We are very enthusiastic about the quality and the easy handling. 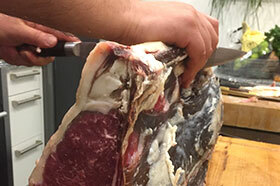 A good investment also for the private Dry Age lover. Since January, we are proud and extremely satisfied of this Dry Ager, which is fully fulfilling our ideas of the maturing of delicious treats. Thank you for the uncomplicated operation and maintenance-friendliness! 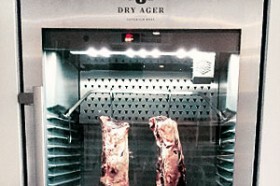 The DRY AGER is an integral part of my gourmet cabin. 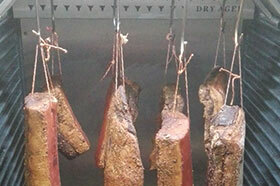 I give the meat of beef, game and game fish through the DRY AGER the absolute culinary experience. In combination with our Big Green Eggs the absolute culinary culture for top gastronomy! Quality and design. Very high quality. The end product is simply fantastic !!! The cabinet works perfectly. Great staff & great service at Landig. The Dry Ager works 110%. Our sale has increased a lot. 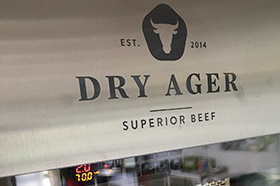 With DRY AGER, we are bringing new customers into our shop. The meat ripening is on a level that could not be better. We will buy one for our branch in 2017. Just awesome! 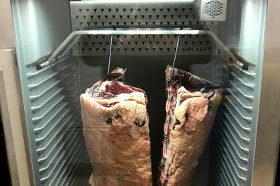 The Dry Ager is the best acquisition this year in our butchery. Demand continues unabated even during the cooler season. The Dry Ager has a great value for money and makes so much fun !!! 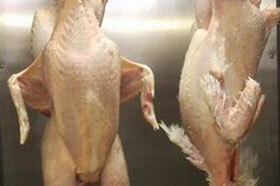 Dry Ager is our laboratory for the development of our superior poultry products. Works perfectly and looks beautiful. We are very satisfied with the device and the results achieved. 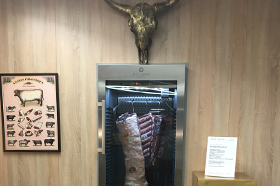 From the first day onwards, we have been able to dry our finest steaks dry without any previous knowledge of the best meat of our regional producer, Bauer Thümmler. The Dry Ager is also a decorative component of our shop furnishings and communicates our understanding of the sustainable handling of food. 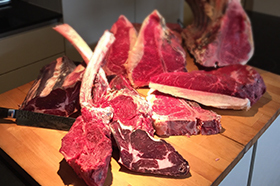 Simple dry age premium meat does not work! 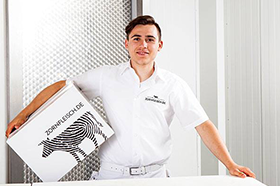 We do not just produce our meat for the barbecue school with the Dry Ager, we also sell it within Austria. 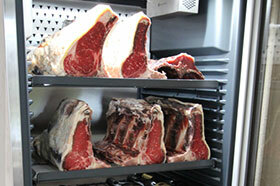 With the Dry Aged is finally a fully ripe cabinet for the ambitious private use available. As hunters and meat lovers, there is a long time on my heart my game on more than just the classic way to enjoy. 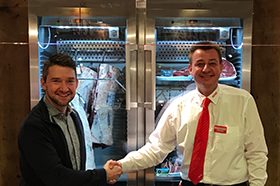 Now it is possible to produce high quality sausage and ham delicacies under controlled conditions and, along the way nice Dry Aged Beef from own production to offer to my clients. The Dry Ager has now got a permanent place in my kitchen since it really does not need to hide. The icing on the cake of course is a good filling. 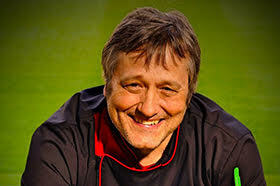 Many thanks again to the Landig team for the absolute professional and friendly support. My new piece of furniture meets with great interest. 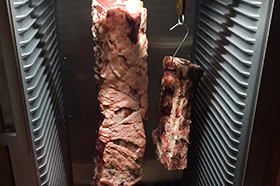 As a big BBQ fan the Dry Ager will have much to do. In addition to cattle there is already a specimen deer hanging with it. I hope for a real treat from my Dry Ager. I’ve put the dry ager in my store my shop builder adjusted the furniture to it. Super optics, the view in the selling room. 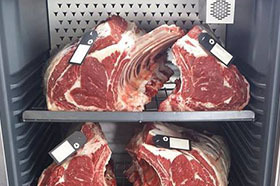 The dry ager itself provides the best meat quality. Our customers are thrilled. 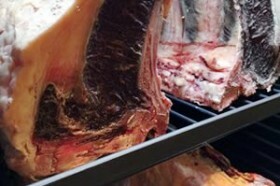 I had already eaten DryAge meat. Pretty mediocre. If the input is correct, the output fits, I was clear. And so I bought a maturing cabinet. Finally, I can produce the desired organic quality myself and the success is maximum: Fantastic taste, incredibly delicate and self-ripened. I’ve been using the Dry Ager for a quarter of a year now and am excited about it every day. 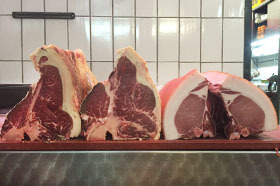 Whether beef, veal or pig – the results always surpass my expectations. 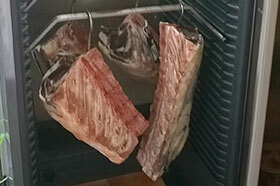 It also provides valuable services for the ripening of raw ham or sausages. High quality materials, best workmanship, sophisticated technology, competent customer service and perfect design. You can not go past him without stopping at least for a moment. For me the Dry Ager is by far the number 1 and a clear purchase recommendation. Since April 2016 we have our DRY AGER in the entrance area – an absolute eyecatcher. 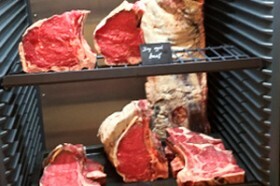 Our guests have the possibility to choose their steaks and are always overwhelmed by the taste experiences. Are fully convinced of the acquisition, works perfectly and very well received by the clientele. Building on this week the second cabinet. So I’m so excited about my Dry Ager, who serves with me not only as a mature cabinet, but also as a special kind of lifestyle and attitude towards life. In addition, I see it as decoration in my living room. The product of the Dry Ager is of course the most important thing and my family, friends, I, etc. 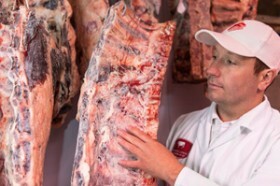 are very impressed of the quality of the meat. I think that I am one of the few that uses the cabinet privately, this is why I “must” eat my product always by myself and have a lot of fun! 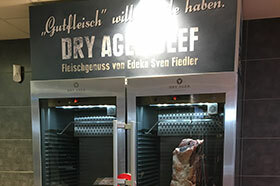 Here in Jagdschloss Prillwitz we test different kinds of meat in the Dry Ager. From deer to highlander we are completely satisfied. It was kept every promise. A great toy that I have done to me for Christmas. Currently I am considering to buy me a second cabinet. 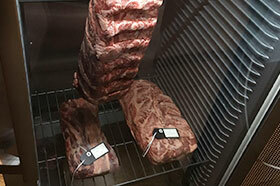 Super it makes fun to store meat! 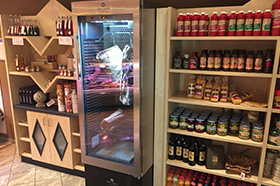 The Dry Ager is a sensational product for grill and meat fans: visually appealing and pleasing in all other aspects – a work of art with delicious contents. The technology works without a glitch. Just hang it up and watch – the results are amazing. The best meat I have ever eaten! my hobby are Scottish Highland cattle and everything tastes great. Since February 2016 I am the proud owner of a DRY AGER. 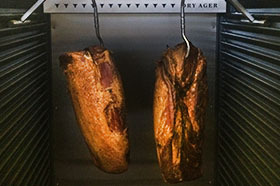 First I smoked pork meat and mature 2 months in an oven at 75% humidity and 9°C temperature. The result is perfect: nice evenly through matured. The first two backs are virtually only sold mouth advertising, without having to make advance advertising. Upcoming back are already approaching. An absolute eye-catcher at our Internorga stand which has excited our customers. We thank you for the uncomplicated cooperation and wish you continued success with the maturity cabinets. We opted for (the) Dry Ager for various reasons. The first was the convincing description for handling and assembly, without additional connections. 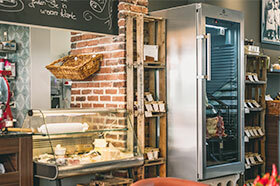 Furthermore, we were very impressed by the design, since the devices are in the customer area and ultimately the very friendly and competent advice by the sales team. Thanks Mr Forster. 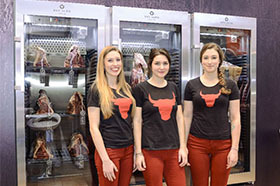 By Dry Ager we are there arrived where we wanted to go: In the league of premium steak manufacturers. 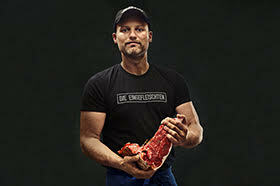 It is a pleasure to watch, like a piece of beef is refined to perfection. The quality appearance of the cabinet makes just joy. It will not be long until we have to buy a 2nd maturity cabinet. 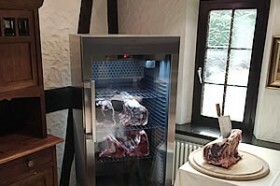 The DRY AGER is the first and only opportunity for us to realize our own maturity chamber in the dining room of our cooking and grilling school. 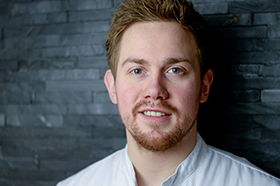 Visually and technically innovative and mature – the first pieces were tasted after 5 weeks and have really blew us away! 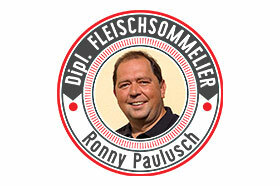 Thanks and lets continue good work together. 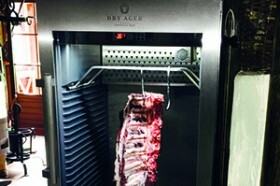 As grill school we are very excited about our DRY AGER. So we can present our seminar participants themselves matured meat in various stages of maturity and grilling it with them. To buy the DRY AGER was a great decision. Highest praise for the developer and the distribution. Just awesome! 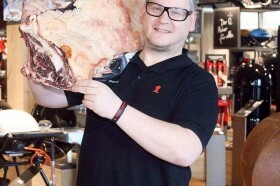 The first 13 kg Rindsnierstück I had five weeks in the closet … unbelievable taste of this. 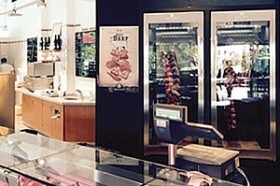 I’m excited and after this test I will also let the customers in my butchery benefit from it. 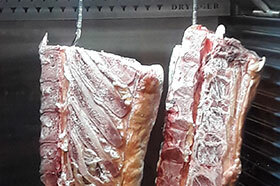 We are very satisfied with the products coming from the dry-ager and can present our customers the aged products right in front of their eyes. Super maturity Fridge with good cost-benefit ratio. 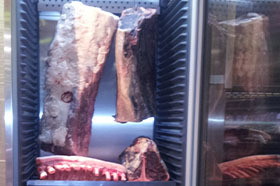 This maturity cabinet gives us the opportunity to pamper our guests with superior Dry Age meat. Thank you! 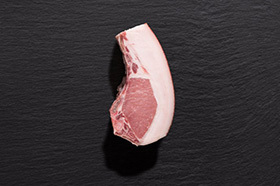 Excellent maturation of pork ham! Works flawlessly, customers are delighted and when customers are delighted the boss is also delighted. 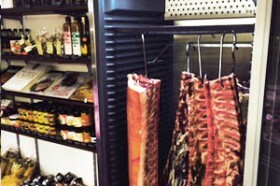 Our dry aging fridges are the bomb! We would love to welcome guests to our main business in the Kalve region. 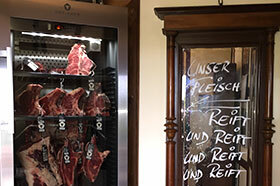 With friendly regards from Luedenschied – Butcher’s Shop Geier. After giving the subject a great deal of thought, the price and look of the device won me over. The Dry Ager is fun. My guests and I were all very satisfied with the results. It’s the perfect choice for my small business and my needs. Great device with a very attractive optic. The price-performance ratio is unbeatable. Saving up to buy the second one. 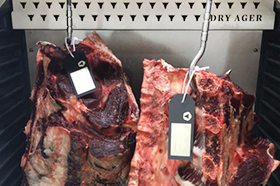 We have been maturing our meat from heifers that originate from controlled animal husbandries in the DRY AGER for quite some time now. This product convinced us and left us fully satisfied. 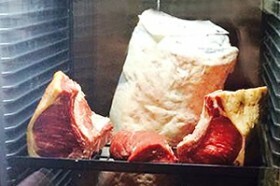 The meat ages evenly and develops the typical dry aged beef aroma. 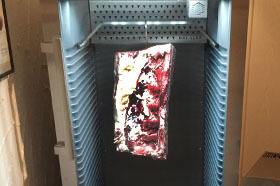 We would also like to point out, that the DRY AGER is uncomplicated and easy to clean. My Dry Ager, best piece of equipment ever purchased. Beautifully manufactured and designed, does exactly what it says on the tin. 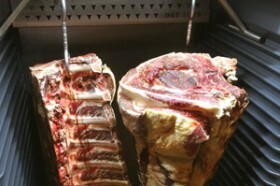 After maturing my beef strip loin on the bone for 54 days, the results were incredible, a taste explosion. Only problem now is that I will not eat beef in any restaurant. A fine product! Very high in quality!! 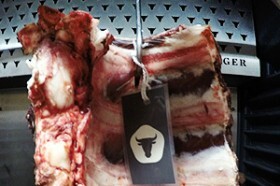 Perfect dry aging results!! Long time saved for it, but every penny was worth it. 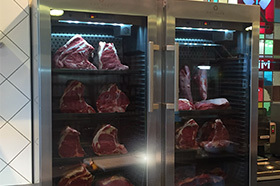 Selecting certain breeds of cattle and meat qualities we operate already for a long time, for Dry Aging we have already for several years a special meat coldstore in our kitchen. 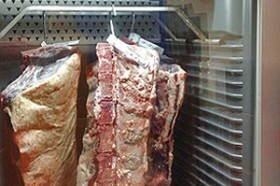 But now we wanted to show our guests the Dry Aging process and thus put a Dry Ager into our guest room. The feedback of our customers is great! 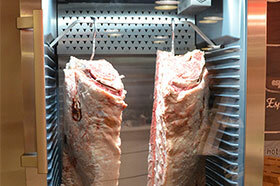 We have since about 5 weeks two maturing cabinets (dry ager) in our direct marketing in operation. They work perfectly and are optically a feast for the eyes. The workmanship and quality is fully in line with our expectations. 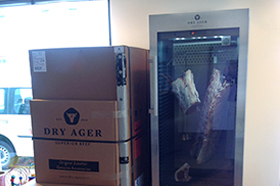 We have been using the Dry Ager for 2 months now and are very satisfied. 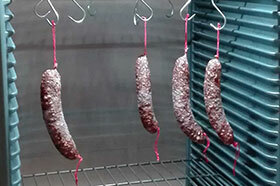 Up until now, we have mostly produced dried sausage and jerky with its help. It is visually appealing and an enrichment for the guestroom facilities. Let’s hope for a long service life and efficient functioning.